Norway has for "ethical" reasons divested from Israel and denied Israeli companies the right to participate in bids. 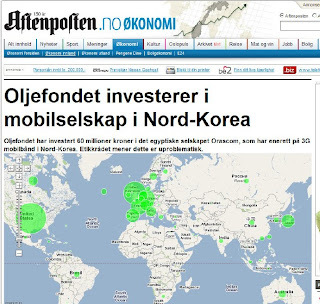 Aftenposten (16/09) reports that Norway now is investing – albeit indirectly – in North Korea. An official states that this is ethically unproblematic. Aftenposten reports that Norway has invested NOK 60 million in the Egyptian telecoms company Orascom, which is the sole concessioneer of 3G mobile networks in North Korea. The company’s venture in North Korea is named Koryolink, and will pay North Korea NOK 2,5 billion over the next three years. This is yet another case of double standards – one for Israel and one for all other countries. There are two reasons Norway can indulge in this kind of politics: 1) Nobody much cares what Norway does or does not do. Most people are unable to place Norway on the map. 2) Israel has a lot of enemies and they are very much in favor of imposing double standards upon her. Here is the reason for why Norway will be unable to keep this up indefinately: 1) A lot of people realize that it is counter-productive to base politics on the lobbying efforts of special interest groups. 2) This site, and others as well, are amassing evidence against the government, clearly pointing out how its policies versus Israel is morally flawed as well as undemocratic – it lacks support in the electorate. Sooner or later the balloon will pop, and Humpty Dumpty will fall of the wall. 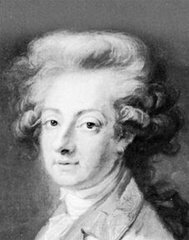 And all the king’s horses and all the king’s men, won’t be able to put Støre together again. NI&J's administrator comment: "I agree that according to EU’s definition of anti-Semitism our government and establishment can be said to be anti-Semitic in that Israel is criticized and singled out for acts which other countries get away with. So Egypt is a good place to go for diving whereas Israel is a country which we must discuss whether or not to boycott. The problem is that the EU’s definition of anti-Semitism is not very well known. In Norway, anti-Semitism is associated with outright, obvious and preferably physical attacks of an immediately noticeable nature. So to physically attack a Jew – because he is Jewish – is recognizable as anti-Semitism and will of course be condemned. But to hold the state of Israel to another standard than that of her neighboring countries is considered "legitimate criticism" which under no circumstances must be seen as anti-Semitism. I also agree that this cannot go indefinitely. We cannot allow it."